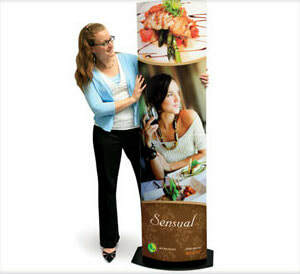 Lightweight and portable with Velcro receptive fabric to add your own images. Choose from a rectangular (optional upgrade to include internal shelf) or triangular shape. Also choose your fabric colour to best suit your needs. 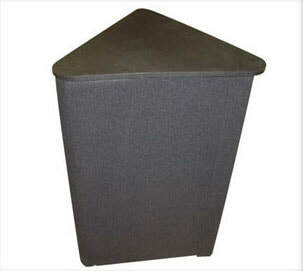 Other podium styles are available. Make a mural. Suspend it. Create a countertop product display. AdBox can handle it. With brilliant graphics printed on vinyl and applied to the lightweight AdBox, it's incredibly light and easy to transport. Eco-friendly and makes a big impact. Create a backdrop, hanging mobile, triangular display – the possibilities are endless! Economically priced and durable. ​Put your business in the spotlight. 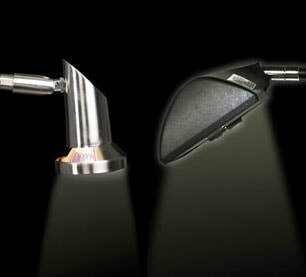 Our collection of high quality focus and spot lights have durable finishes and boast a variety of mounting and clamping methods. All complete with transformers and bulbs. AdStand is a unique strategic tool for communication and campaign planning. 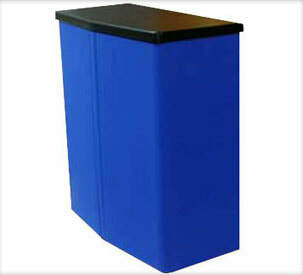 The sturdy base means that it will hold up to in-store use and for tradeshows. 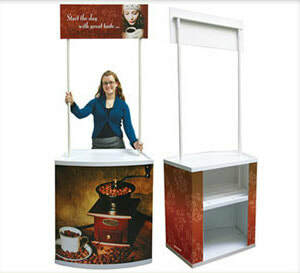 AdStand comes in a ﬂat package for optimized distribution and is lightweight and easy to set up. The double-sided exposure and eye-level height give a maximum impression. The elegant ellipse-shaped graphic AdSleeve brings you a new look. Keep the AdBox and base, only replace the AdSleeve and you have a new display. Choose an oval-shaped base or a round one to best fit your needs. Always make your message stand out! ​Customize a self-supporting statement. 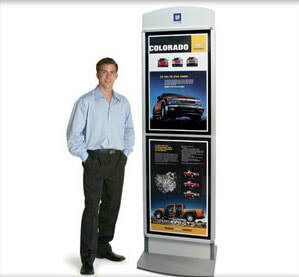 Use a freestanding image display. 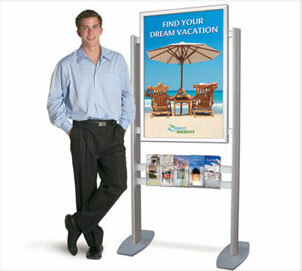 The brochure holder of this well-built display makes sure your message gets into the right hands. QuikFrame or InFrame make changing graphics a snap. Design its base to suit your corporate identity. This unit is no pushover. Its sturdy construction means it’ll stand, and deliver. ​Got more to say? 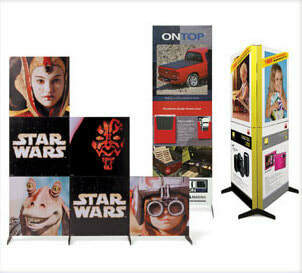 This customized robust poster stand lets you display two graphics on each side. Its solid build means it’ll stay put. QuikFrame or InFrame make it easy to change visuals. Be creative with your header to brand your logo. Then put it anywhere customers might have to wait. Standing around just got a whole lot more interesting.